Vandalism in parks has been a long-standing issue, particularly during the summer months when parks have their most patrons. Cities are now using a variety of methods to combat vandalism in parks. Some are working harder to enforce rules with volunteer patrols. Others are installing prefabricated restrooms, which are designed to make vandalism more difficult. Security cameras and zero tolerance policies are other ways to monitor and work against vandals. In the fall of 2011 the city of Perryville, Mo., began researching options to replace outside park restrooms that were not only continuously getting vandalized but also worn out from age. 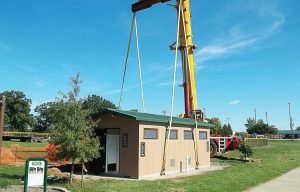 City employees took road trips to visit other facilities with various types of prefabricated restrooms, and in the end, they chose the CXT restrooms based on the attraction that they were vandal resistant. 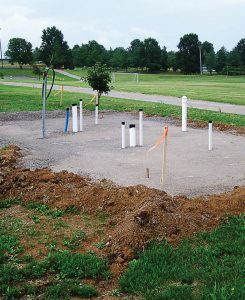 According to Keith Riney, parks maintenance manager, the city was in charge of all the site’s necessary prep work prior to installation of the restrooms. The site requirements included a flat surface of concrete or compacted rock and the installation of sewer pipes, water lines and electrical lines. 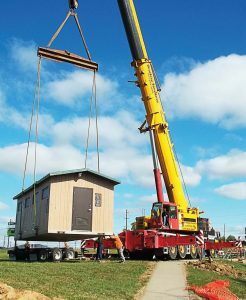 Each prefabricated restroom was shipped to the site on a lowboy flat bed trailer and set in place by a crane. CXT was in charge of hiring crews to set the units in place and make all final utility connections on the prepared site. Riney believes that the installation of these restrooms has decreased vandalism by between 25 and 50 percent. The park ambassador program in Bettendorf, Iowa, was created because “community members thought it would be a good idea to have one or two people a night making rounds in city parks in an effort to not only remind patrons of park rules and city ordinances, but also to answer any questions, provide directions or offer any other courtesy services that a park patron may require,” Isaac Jacobs, park ambassador and volunteer project program coordinator, said. 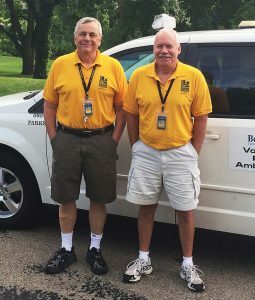 The program began in 2002 through the teamwork of Ron Maday, former park ambassador coordinator, and Steve Grimes, director of parks and recreation. In the beginning it was just a few volunteers going around to the city’s parks as many nights as possible a week. While the number of volunteers has fluctuated throughout the years, they average 22 ambassadors every summer. This year volunteers numbered only 15, but at its peak, there were 30 ambassadors. Each summer the ambassadors are required to attend an orientation meeting to go over common infractions of park rules and tips on how to best inform a visitor at the park that they are breaking a rule. They receive a uniform with “park ambassador” printed on it along with a city ID badge. They are also able to use city vehicles to drive to and from each park and receive a police radio so they are able to communicate with the police department if needed. The average shift is from 6-11 p.m. and involves patrolling the city’s parks and bike paths, stopping by the busiest parks multiple times per shift. Ambassadors are to spot check a minimum of two park playgrounds and two park restrooms each shift looking for vandalism or broken playground equipment. If vandalism is present, ambassadors are equipped with spray paint to cover it. If the vandalism appears to be gang related, the ambassadors will contact the police and ask them if they’d like the ambassadors to take photos of the graffiti. Graffiti tends to be the most common method of vandalism, typically underneath overpasses and in or on structures like bathrooms or shelters. Since the parks tend to be busiest — and, therefore, vandalism more prevalent — between Memorial Day and Labor Day, that is how long the program runs each year.